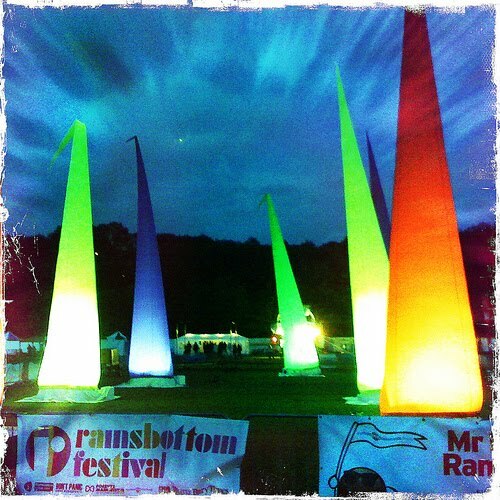 Rain factor: You have an outdoor music festival in Ramsbottom. In September. Of course it's going to rain. The question is, how much and when. This rain wasn't too bad - it came and went, it was a bit of a drag, but you could mostly ignore it. There was always a place to get out of it if you wanted to.There was no wading through mud. We even had a few hours of sun on Sunday. Runners up: Cherry Ghost, The Travelling Band and Young Knives all turned in solid performances on Saturday, Capercaillie rocked on Sunday. 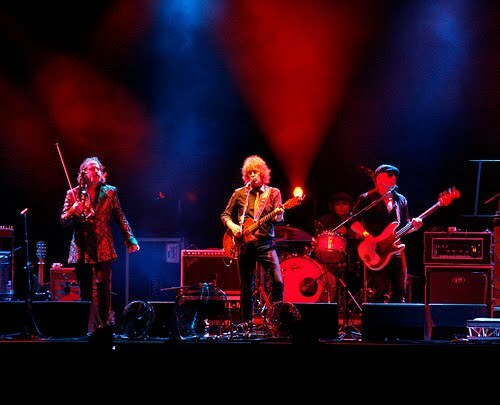 Can a traditional Celtic band rock? The answer is yes. Miss (Non)Congeniality award: Badly Drawn Boy. I've always been kindly disposed to the beardy one's music, but after seeing this performance I'm less kindly disposed. He started things off by having a hissy fit about the sound and finished up by grousing that he should have been the headliner. In between: a whole bunch of meh. Stay in Chorlton next year and knit yourself some new hats, dude. Personal disappointment: Missing Steve Cropper Friday evening. It was very wet, but still. Taste sensation: Salted Caramel and Peanut Butter ice cream on a toasted brioche from the wonder that is Ginger's Comfort Emporium (long may they reign.) Really freaking good. Best non-live-music-related activity: Silent Disco. Lots of fun. Unexpected impressive thing: Whalley Range All Stars "PIG" performed inside a specially-built pig. The play was ten minutes long and only ten people could watch it at once. The audience had to don curly tails and stick their heads right into ten holes along the pig's belly, so they looked like a line of piglets. Best thing for kids: The bouncy pirate ship, apparently. I spent about two hours standing next to this handing a very polite teenage girl money while my daughter bounced. And bounced. And bounced. Lots of kids about on Sunday, not so many on rainy Saturday. 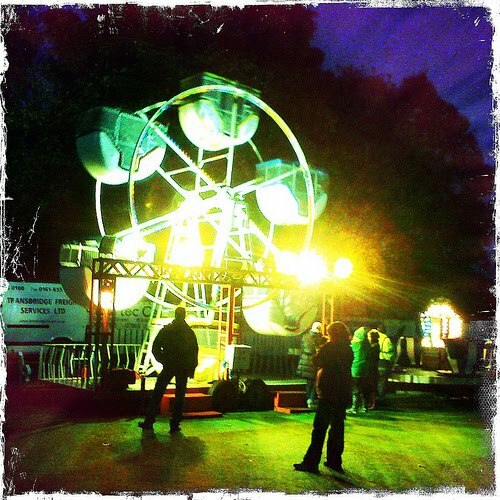 And don't ferris wheels look cool at night? Comfort Factor: Weather aside, the festival was a pretty comfortable place to hang out. The drinks were excellent and keenly priced - Outstanding Beers' very pleasant festival real ale at £2.50 for a reasonably sized pint, fancy shmancy cider for £3.50. I think they had some weird mixed-drink-in-a-bottle stuff going on too, but I didn't get involved in that. In short, a far sight better than the shockingly bad beer selection (Bud and Coors?? In plastic bottles? Really?) at the Manchester International Festival pavillion this summer. You got served quickly at the bar. The food vendors were good and again, nobody was ripping you off (£5 for a massive plate of tasty Tibetan Kitchen.) There were enough toilets, so you didn't spend hours in the loo queue, and they stayed reasonably clean. Thumbs up. Best flavor of Rekorderlig Cider: Strawberry Lime. I know, me either. Unexpected funny thing: The VIP area resembled a cattle market - a roped off, exposed-to-the elements plot with bare benches, about as far from the stage as it could be. I think I saw two people in there all weekend. That kind of sums up the festival's ethos nicely. 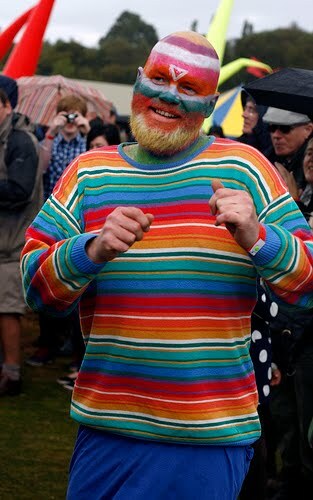 Hero of the day: Stripeyman. The tirelessly boogieing, permanently ecstatic painted fellow below will dance on in the memories of festivalgoers for many years to come. I'll have what he's having. In summary: a very good time. Of course, I walked down the road to get there, was sensibly attired and got in for free, so admittedly it would have to be awful for me not to have enjoyed it. But it surpassed my expectations in pretty much every way (apart from the weather, sadly.) Hey, I'm looking forward to next year already. We saw Badly Behaved Boy at Bumbershoot in Seattle and he spent the first 15 minutes berating the sound guys, who were as mystified as everyone else what the actual problem was. And he was also very "rebellious" when it came to observing the Bridgewater Hall curfew a few years ago. Funny way to conduct yourself if you're a professional musician. Nice bloke though, apparently. Nice review Kate, highlight for me was Capercaillie, waited years for these guys to come 'local' so yes.. Capercaillie. Did it rain?... the vibe made it disappear. £2.50 for festival bitter ...excellent and I only had one pint on Sunday coz of the early start on Monday. Badly Behaved Boy's poor sound was down to his duff guitar lead... NOT the sound guys who were close to linching the tea cozied idiot. Hilarious: "Stay in Chorlton next year and knit yourself some new hats, dude"
this looked like a really brilliant time. And that ice cream, YUM!